We are thrilled to present an interview with Alexandra Cavanaugh, one of the most beloved St. Patrick's teachers, who recently retired after teaching at St. Pat's for over 27 Years! When did you start teaching at St. Patrick's? I taught full-time at St. Patrick’s from 1987-2014. Before teaching at St. Pat's, I taught in both Pennsylvania and Florida. I began by teaching fourth grade. A few years later, I moved to third grade, Room 204 to be exact. It was my home away from home. I truly loved the students, parents, and teachers. St. Pat’s is like a big family. Where did you grow up and what is your educational background? I grew up in East Northport, attending grammar and high school in District 4. After high school, I earned my Bachelor’s Degree from The University of Tampa. I then went on to earn my Master's Degree in Reading from Dowling College. I am the oldest of three children. I loved books from the time I was little and I often read to my little brother and sister. I had a chalkboard in my basement and played school down there all the time. I have always wanted to be a teacher. How did you see St. Pat's change over the years? What was the biggest change from a teaching perspective? What stayed the same? Over the years, the physical appearance of the school changed for the better. On the inside - things changed, too. New technology was the biggest change. I saw things introduced like the use of desktop computers and later, Smartboards and even iPads. St. Patrick’s kept up with the changing times, but thankfully, we always kept God and our faith at the top of the list. What did you find to be the most rewarding thing about teaching? I loved finding the strengths that each of my children had - and finding a way to build on them. I loved seeing those smiling faces when they were feeling successful. I enjoyed turning learning into fun. You were one of the most beloved teachers at St. Pat’s for many years. You were known in particular for fostering the students’ love of both reading and math. Can you tell us how you did that? I believe that you should read to your class every day - even if it is just for 15 minutes. I chose authors like Beverly Cleary, Roald Dahl and even Henry Winkler. Children love being read to whether they are very young or older. In fact, my very first class was a 5th grade and I read to them every day! When it came to Math, I used games as a way to learn. Flash cards were great and I used them after lunch daily. At the beginning of third grade, we used addition and subtraction cards. Later on, I added the multiplication and division cards. I even found cards for telling time. Any time you can turn something into a game, children get interested and excited. I never forced anyone to play, but when the children in their seats found out how much fun it was, everyone joined in and played. I awarded the children certificates for 1st, 2nd, and 3rd place, they loved those. I have been married for 42 years. My husband has been retired for the past few years. My brother and sister are both married and doing well. My father passed away in 1991, but my 92 year old mother is alive and still living in East Northport. I never had any children of my own, but always loved the students in my class. Each class was like family to me. When did you retire and how are you enjoying it? I officially retired as a full-time teacher this past June. I am enjoying some things. I had close to an hour commute to school everyday, so it is nice not having to get up so early! 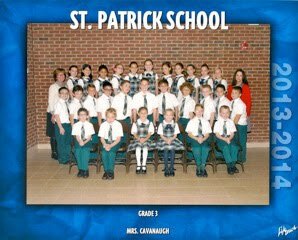 However, I have decided to return as a substitute at St. Patrick's because I miss the children, Sister Maureen, Jean Grasso, and the other teachers. It turns out that I am not ready to leave St. Pat's completely! So far, I have been in to substitute for the second and third grade classes. As always, it is so much fun.